There’s no doubt that using a mouse to navigate through Windows makes it really easy to use our computers. But, sometimes, the mouse pointer might disappear from your screen. This can happen randomly but most of the times it happens after an upgrade or a Windows update. It can also happen to systems that are on sleep mode a lot. 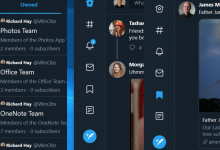 You can still navigate and use your Windows via your keyboard but it will be a really cumbersome task. There are a couple of things that might cause the issue. This might happen because of an issue in the driver. The driver might be updated to a newer version or it might be outdated. But, sometimes the issue might be because your mouse device got disabled for some reason. There are other scenarios where you might have disabled your mouse accidentally. There are a lot of solutions for this problem and usually it will be solved within a short span of time. So, go through every method given below until the problem is solved. 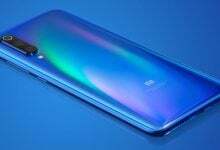 Note: The methods given below works for both mouse and touchpad. 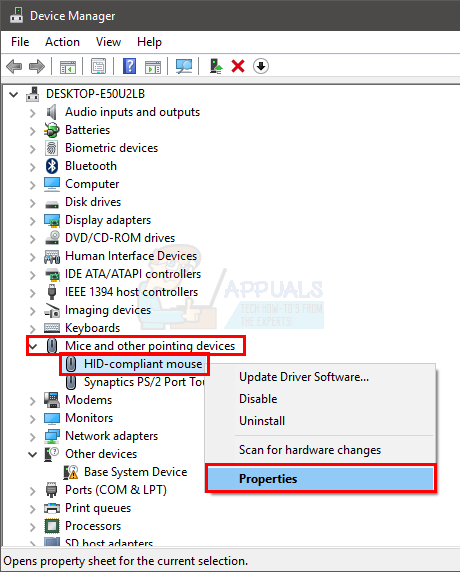 Sometimes the touchpad gets disabled as well or its new drivers might not be compatible. Use the same methods for touchpad, just select your touchpad in the steps instead of your mouse. A lot of users accidentally turn off the mouse pointer via their keyboard. The key F5 is generally used to disable the mouse so try pressing F5. 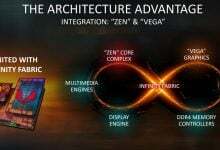 If that doesn’t work then try (function key) FN + F5 or FN + F9 if you are using ASUS or FN + F7 if you are using an Acer machine. The keys might be different depending on the keyboard/brand. You can check the manual from the manufacturer’s website to see which key is used for the mouse function. If nothing else works, look through the keyboard keys very carefully to check if there is a key with a mouse indicator on it. Usually, these keys have an icon on them to give you an idea about their function. If you see a key with a mouse icon then try pressing it and try pressing it with the FN key as well. This method is used to fix the problem by enabling your mouse device. Sometimes, the mouse device gets disabled either accidentally or intentionally. Setting it back to being enabled will mostly solve the issue. Now your Device Settings tab should be select. Use your arrow keys to switch between the tabs (you will see a dotted square around the button/tab that is selected). If, for some reason, your tab isn’t select, press the tab key from your keyboard once. You will notice that your keyboard focus has been shifted to the first button in the tab. Basically, the tab key moves the selection to the next clickable object e.g. button. So, keep pressing tab until the dotted square comes to one of the tabs of the window. Once the tab is selected, use arrow keys to go to the Device Settings tab. 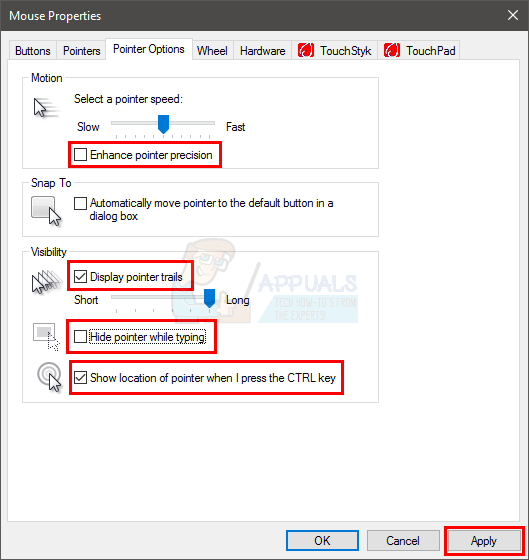 This will enable your mouse and you should be able to see your mouse pointer now. Note: in case you are doing this for the touchpad, you should see a tab TouchPad (most likely at the end). Select the TouchPad tab instead of the Device Settings in step 3 and then enable the TouchPad in step 4. Sometimes, the issue is with the drivers of the mouse. 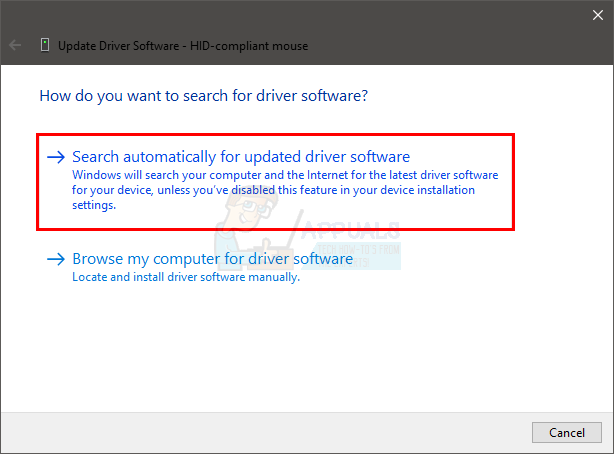 Your driver might automatically be updated to a newer version which isn’t compatible or have a bug. In that case, you should roll back the driver. 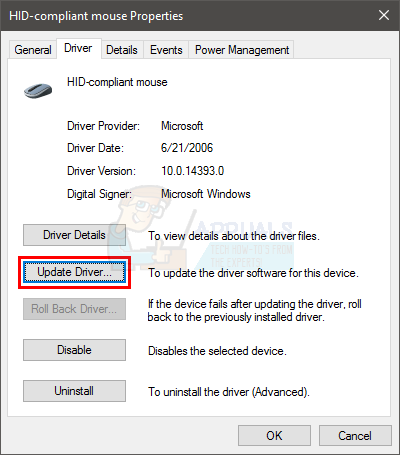 On the other hand, if you haven’t updated your drivers for a while then you should update the drivers. 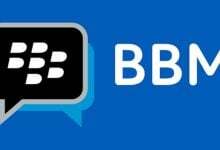 There isn’t a way to confirm was is causing the issue. So, you should try to update the driver first and if that doesn’t work then roll back the driver to see if that solves the problem. Use up and down keys to move through the list. If your arrow keys aren’t working then press Tab key once and then the arrow keys should work. Navigate to the Mice and other pointing devices using the arrow keys. 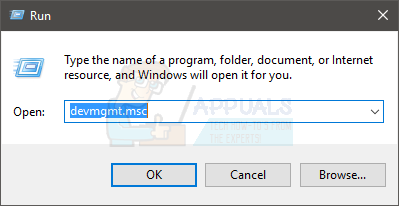 Press the down arrow key to move the selection on the context menu. 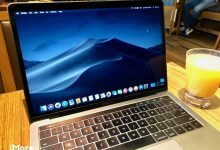 Select Properties and press Note: Select Synaptics PS/2 Port (or your TouchPad name) if you are having trouble with the TouchPad instead of the mouse. Wait for it to complete and check if the mouse pointer is working or not. 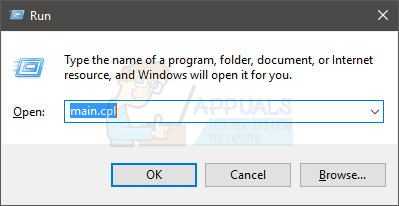 If it doesn’t find any new updates or the update didn’t work then use the arrow keys to navigate to the cancel button and press This should bring you back to the properties window of your mouse device. Note: make sure the Roll Back Driver… button isn’t greyed out. 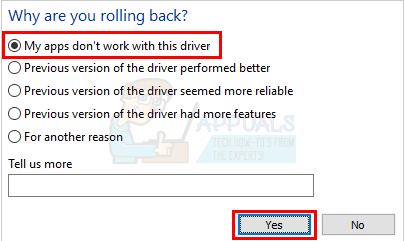 If the Roll Back Driver… button is greyed out then don’t follow the next step. Keep pressing Tab until you reach the Roll Back Driver… button and then press Enter. This should roll back the drivers. Once the process is complete, check if the pointer came back or not. 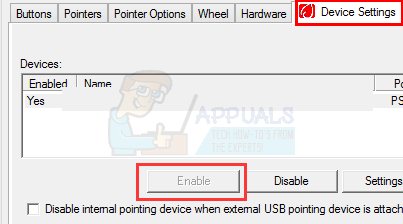 You can change a few settings of the pointer that will bring back the mouse pointer. This is mainly because the disappearance of the pointer might simply be the effect of your pointer settings. For example, the option “hide the pointer while typing” hides the pointer for as long as you typing which might be confusing to a lot of people. This isn’t a solution but more of a precaution to check if the settings aren’t causing the issue. Keep pressing the Tab key until the focus (dotted square) comes to the option Enhance pointer precision. You should uncheck this option. Press Enter to check/uncheck the option. Keep pressing the Tab key until the focus (dotted square) comes to the option Display pointer trails. You should check this option. Press Enter to check/uncheck the option. Keep pressing the Tab key until the focus (dotted square) comes to the option Hide pointer while typing. You should uncheck this option. Press Enter to check/uncheck the option. Keep pressing the Tab key until the focus (dotted square) comes to the option Show location of pointer when I press the CTRL key. You should check this option. Press Enter to check/uncheck the option. Reboot the system. Press Windows key once to open the Start menu and then use the Tab key to navigate between the sections. You can then use the arrow keys to move to the power option and press Enter. Now, you can select whether to shut down or reboot using the arrow keys and then press Enter. Now, check if the pointer is appearing or not. If you still can’t find the pointer then press the CTRL key once to see the location of the pointer.